More than 20,000 pre-paid meals were bought for homeless people within 10 hours of a festive campaign being launched. Itison began its fourth annual festive fundraiser for Social Bite on Tuesday. 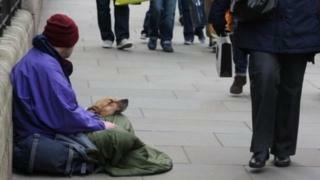 Within 10 hours, 20,668 vouchers had been donated to help feed rough sleepers in Scotland. 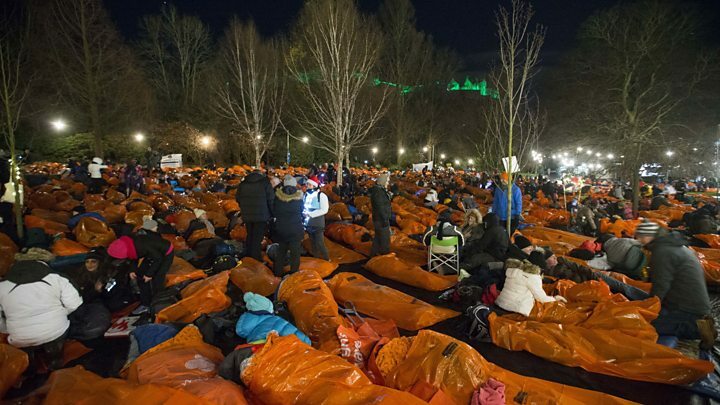 On Saturday, about 9,000 spent the night in Princes Street Gardens in Edinburgh as part of Sleep in the Park, organised by Social Bite. Josh Littlejohn, co-founder of Social Bite, said: "Before our first Itison fundraiser in 2014, we were a small social enterprise and often ran out of food donated through our pay-it-forward scheme, and would have to turn people away or ask them to come back later. "After the first Itison fundraiser ran, we were completely blown away by the response - over 32,000 vouchers were donated, allowing us to provide meals not just on Christmas Day but right throughout the year. "Each year it gets bigger and bigger and since it launched we've never had to turn away a single person which is just incredible." Last year, 75,755 vouchers were donated on Itison, allowing Social Bite to provide hot meals for homeless people throughout the year. The food firm's Glasgow, Edinburgh and Aberdeen cafes will open their doors to serve rough sleepers on Christmas Eve and Christmas Day to serve dinners with all the trimmings. All the money raised will go to Social Bite. Liam Gallagher, John Cleese and Deacon Blue performed at Sleep in the Park. Oli Norman, chief executive of Itison, said: "Around 18 of us took part in Social Bite's Sleep In The Park at the weekend and that teeny glimpse into what it's like sleeping in the freezing cold highlighted just how wrong it is that in this day in age, people are still having to sleep rough in such treacherous conditions."